IMPORTANT Complaint under Section 138 of Negotiable Instruments Act - Once evidence is given by way of affidavit, at the stage of pre-summoning, the same evidence is to be read by the court at post summoning stage and the witness need not be recalled at post summoning stage unless court, for reasons, considers it necessary. For the Petitioner :- Mr. Vikas Manchanda, Advocate. For the State :- Mr. O.P. Saxena, APP. 1. On the day complaint is presented, if the complaint is accompanied by affidavit of complainant, the concerned MM shall scrutinize the complaint and documents and if commission of offence is made out, take cognizance and direct issuance of summons of accused, against whom case is made out. 2. If the accused appears, the MM shall ask him to furnish bail bond to ensure his appearance during trial and ask him to take notice under Section 251 CrPC and enter his plea of defence and fix the case for defence evidence, unless an application is made by an accused under section 145(2) of N.I. Act for recalling a witness for cross examination on plea of defence. 3. If there is an application under Section 145(2) of Negotiable Instruments Act Act for recalling a witness of complainant, the Court shall decide the same, otherwise, it shall proceed to take defence evidence on record and allow cross examination of defence witnesses by complainant. 4. To hear arguments of both sides. 1. Under section 144 of Negotiable Instruments Act service of accused can be effected through registered post/speed post or by courier service and if the accused refuses to receive the summons, he can be declared served and court can take coercive measures for entering appearance of the accused. Shiv Narayan Dhingra, J. - The above & many more petitions arisen out of the proceedings pending before the Trial Courts under section 138 of Negotiable Instrument Act (N.I. Act) are pending before this Court. 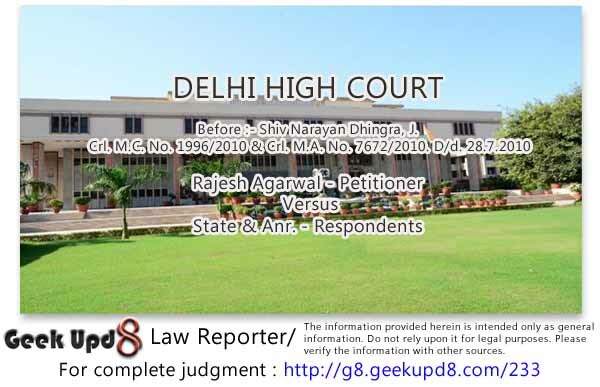 It is seen that the High Court is being flooded with petitions under section 482 Cr.P.C. for quashing of complaints under section 138 N.I. Act on the ground that learned MMs cannot recall their own orders of summoning and it is the High Court that should consider that the complaint under section 138 of N.I. Act was not maintainable against the petitioners. Reliance is placed on Adalat Prasad v. Rooplal Jindal and Others; 2004(4) R.C.R. (Criminal) 1 : 2004(3) Apex Criminal 459 : (2004) 7 SCC 338 to press the point that the petitioners have no other alternative but to approach the High Court. While Adalat Prasad case (supra) laid down that if a Magistrate takes cognizance of an offence and issues process, without there being any allegations against the accused or any material implicating the accused, the order of Magistrate may be vitiated, but the relief, an aggrieved accused can obtain at that stage is not by invoking Section 207 of Cr.P.C.. The remedy lies in invoking section 482 Cr.P.C. It is clear from the Judgment of Adalat Prasad case (supra) that Section 482 of Cr. P.C. can be resorted to only where the High Court is called upon to examine the complaint and material available before the Trial Court at the time of summoning per se to arrive at a conclusion that no case was made out against the petitioner/accused. However, in all the petitions pending before this Court and other petitioner flowing before this court daily, the quashing of summoning order is sought not on the ground that complaint and evidence adduced by the complainant before MM do not disclose commission of offence by the petitioner, but, on the ground that petitioner had various defences like - the petitioner was not the Director of the company at the time when cheque was issued or when cheque was dishonoured; the petitioner was not responsible for conduct of business of company/firms, the petitioner was only a sleeping partner in the partnership firm, the issuance of cheque and its dishonour was without the knowledge of the petitioner, that cheque was issued without consideration, the cheque was issued as security, the cheque though issued by the petitioner was not from his own account but from some other account, the petitioner was a Director but had resigned from Directorship at the relevant time etc.. Many similar or other defences are raised in these petitions while invoking inherent powers of this Court under section 482 Cr.P.C. The argument advanced in all such cases is that the material & documents in custody of the petitioner show that he was not involved in day-to-day business, but such unimpeachable documents cannot be considered by the court of MM at initial stage and they should be considered by the High Court for quashing the complaint. It is submitted in these petitions that subjecting the petitioner to a long drawn trial would amount to curtailment of liberty of the petitioner and if the petitioner was not involved in the offence why he should be subjected to a long drawn trial. 2. One of the reasons that these petitions are flooding High Court is that the petitioners involved, in most of the cases, are affluent persons who do not wish to appear before the Courts of MM or consider it below their dignity to go to lower court and come rushing to High Court on mere passing of a summoning order and are successful in halting proceedings before the lower court on one or the other ground; while the kind of defences raised by the petitioners are required to be raised before the Court of MM at the very initial stage as per law. 3. The objectives of the proceedings of Section 138 of N.I. Act is that cheques should not be used by persons as a tool of dishonesty and once a cheque is issued by a person, it must be honoured and if it is not honoured, the person is given an opportunity to pay the cheque amount by issuance of a notice and if he still does not pay, he must face the criminal trial and consequences. However, the effort of some of the petitioners is to teach a lesson to complainant for approaching court of law. The amount of cheque is not paid despite demand notice and the complainant is made to suffer further by prolonging the litigation carrying it from one forum to other. In many cases, the petitioners do have genuine defence, but, due to mis-reading of the provisions of N.I. Act and Cr.P.C., it is considered that the only option available is to approach the High Court and on this the High Court is made to step into the shoes of Metropolitan Magistrate and examine their defence first and exonerate them. I consider that this situation is arising because of the fact that MMs at lower court are not following the mandate of the statute of conducting trial of cases under section 138 of N.I. Act in a summary manner and despite amendment in N.I. Act continue trying these cases as summon trial cases and a long drawn procedure is followed. 4. Section 143 of N.I. Act, as amended by Legislature in 2002, specifically provides that all offences under this chapter of N.I. Act are to be tried by Judicial Magistrate of First Class or MM in accordance with summary trial provisions of Sections 262 to 265 Cr. P.C. (both inclusive). It is provided that in case of conviction of the accused under section 138 N.I. Act under summary trial, it shall be lawful for the Magistrate to pass a sentence of imprisonment up to one year and a fine exceeding Rs. 5000/-. Section 143 further provides that if at the commencement or during the course of summary trial, MM finds that nature of case was such that a sentence of imprisonment exceeding one year may have to be passed or for some other reason MM comes to conclusion that case should not be tried summarily, the Magistrate has to pass an order after hearing the parties, giving reasons as to why he would like to try the case not in a summarily manner but as a summon trial and he could recall witnesses who may have been examined and proceed with the case to hear it as a summon trial case. 145. Evidence on affidavit - (1) Notwithstanding anything contained in the Code of Criminal Procedure, 1973 (2 of 1974), the evidence of the complainant may be given by him on affidavit and may, subject to all just exceptions be read in evidence in any enquiry, trial or other proceedings under the said Code. (2) The Court may, if it thinks fit, and shall, on the application of the prosecution of the accused, summon and examine any person giving evidence on affidavit as to the facts contained therein. 6. Summary trial procedure is given under sections 260 to 265 of Cr. P.C. As per this procedure also when during the course of summary trial, it appears to the Magistrate that nature of case was such that it was desirable to try it as a summon trial, he has power to recall any witness who has been examined and proceed to re-hear the case in the manner provided in the Code. 7. The difference between summary trial and summon trial is thus obvious. In summary trial after the accused is summoned, his plea is to be recorded under section 262 (g) of Cr.P.C. and his examination if any can be done by MM and a finding can be given by the court under section 263(h) of his examination. The same procedure is to be followed by the MMs for offence of dishonour of cheque. If proviso a, b & c to Section 138 N.I. Act are shown to have been complied with, technically the commission of offence stands completed. It is for the accused to show that no offence could have been deemed to be committed by him for some specific reasons & defences. He cannot simply say "I am innocent" or "I plead not guilty". 8. The procedure being followed presently by learned MMs under section 138 of N.I. Act does not commensurate with the summary trial provisions of Cr.P.C. and provisions of Negotiable Instrument Act and that is the reason that decisions of cases under section 138 of N.I. Act is taking unnecessary long time and the complaints remain pending for years. The procedure as prescribed under law is that along with complaint under section 138 of N.I. Act, the complainant should file affidavit of his evidence and all necessary documents like dishonour memo, returned cheque, notice of demand and then learned MM should scrutinize the complaint & document & if he finds that the affidavit and the documents disclose dishonour of cheque issued by the accused, issuance of a demand notice by the complainant, nonpayment of the cheque amount by the accused despite notice, cheque return memo of the bank etc. and if the court finds that the complaint was filed within the period of limitation, cognizance is to be taken and notice of appearance of accused should be sent to the accused. In case the accused appears before the court of MM, the Court should ask him as to what was his plea of defence. Normally the first date is wasted by the courts of MM just by taking bail bond of the accused and passing a bail order, while section 251 & 263(g) of Cr. P.C. provide that when the accused appears before MM in a summary trial proceedings, the particulars of the offence, to which he is accused, shall be stated to him & he should be asked whether he pleads guilty or he has any defence to make. This is the mandate of section 143 of N.I. Act, which provides summary trial of offence in terms of Cr. P.C. Under Section 263(g) of Cr.P.C., the court has to record the plea of the accused and his examination. It is thus obvious that in a trial of an offence under section 138 N.I. Act the accused cannot simplicitor say "I plead not guilty" and wants to face trial. Since offence under section 138 of N.I. Act is a document based technical offence, deemed to have been committed because of dishonour of cheque issued by the accused or his company or his firm, the accused must disclose to the Court as to what is his defence on the very first hearing when the accused appears before the Court. If the accused does not appear before the Court of MM on summoning and rather approaches High Court, the High Court has to refuse to entertain him and ask him to appear before the Court of MM as the High Court cannot usurp the powers of MM and entertain a plea of accused why he should not be tried under section 138. This plea as to why he should not be tried under section 138 is to be raised by the accused before the Court of MM under section 251 & under section 263(g) of Cr. P.C. Along with his plea he can file necessary documents and also make an application, if he is so advised, under Section 145(2) of N.I. Act to recall the complainant to cross-examine him on his plea of defence. However, only after disclosing his plea of defence he can make an application that the case should not be tried summarily but as a summon trial case. This application must disclose the defence of the accused and the reasons why he wants the case to be tried as a summon trial. 9. An argument is raised that the accused, under Article 21 of Constitution of India, has a right of silence in a criminal trial and therefore he cannot be forced to disclose his defence. This argument is misconceived in view of Section 106 of Indian Evidence Act. Since an offence under section 138 of Negotiable Instrument Act is technical in nature and defence which an accused can take are inbuilt, like the cheque was given without consideration, the accused was not Director at that time, accused was a sleeping partner or a sleeping Director, cheque was given as a security etc. etc., the onus of proving these defences is on the accused alone, in view of section 106 of Evidence Act. Since the mandate of Legislature is trial of such cases in a summary manner, the evidence already given by the complainant by way of affidavit is sufficient proof of the offence and this evidence is not required to be given again in terms of section 145(1) of N.I. Act and has to be read during the trial. The witnesses i.e. the complainant or other witnesses can be recalled only when accused makes an application and this application must disclose the reason why accused wants to recall the witnesses and on what point witness is to be cross examined. One must not forget that the offence under section 138 of N.I. Act is not of the kind of offence as in IPC where the State prosecutes a person for offence against the society. The offence under section 138 of N.I. Act is an offence in the personal nature of the complainant and it is an offence made under N.I. Act so that the trust in commercial transactions is not destroyed because of the dishonour of cheques. When it is within the special knowledge of the accused as to why he is not to face trial under section 138 N.I. Act, he alone has to take the plea of defence and burden cannot be shifted to complainant. There is no presumption that even if an accused fails to bring out his defence, he is still to be considered innocent. If an accused has a defence against dishonour of the cheque in question, it is he alone who knows the defence and responsibility of spelling out this defence to the court and then proving this defences is on the accused. I, therefore, consider that the proper procedure to be followed by MM is that soon after summoning, the accused must be asked to disclose his defence & his plea should be recorded. Where an accused takes no defence and simply says "I am innocent", there is no reason for the MM to recall the complainant or witnesses during summary trial and the evidence already given by the complainant has to be considered sufficient and the trial court can ask the accused to lead his evidence in defence on the plea of innocence as the evidence of the complainant is already there. In a summary trial, a complainant or his witness cannot be recalled in the court for cross examination only for the sake of pleasure. Once the complainant has brought forward his case by giving his affidavit about the issuance of cheque, dishonour of cheque, issuance of demand notice etc., he can be cross examined only if the accused makes an application to the court as to on what point he wants to cross examine the witnesses and then only the court shall recall the witness by recording reasons thereto. 10. The procedure now being adopted by the MMs is totally contrary to the provisions of Code of Criminal Procedure and Negotiable Instrument Act. Presently, after summoning the accused, the complainant and his witnesses are asked to re-appear and give evidence again and that is the reason that cases keep on lingering for complainants evidence for years together and such accused who have documentary evidence of their not being liable to face trial, rush to High Court. 11. The trial under section 138 of NI Act cannot be carried like any other summons trial under IPC offences. The documents placed on record of the Court about the dishonour of cheque are the documents from banks and unless the accused says that these documents are forged, or he had not issued the cheque at all, he did not have any account in the bank, the cheque was not signed by him, the cheque book was forged by the complainant or other similar claim, the evidence of the complainant about dishonour of cheque cannot be questioned, nor the complainant can be asked to depose before the court again. If the case under section 138 N.I. Act, which is document based, is not tried in summary manner, the sole purpose of making this offence summary trial stands defeated. Thus in all cases under section 138 of N.I. Act, once evidence is given by way of affidavit, at the stage of pre-summoning, the same evidence is to be read by the court at post summoning stage and the witness need not be recalled at post summoning stage unless court of MM, for reasons, considers it necessary. 38. Sub-section (1) of Section 145 gives complete freedom to the complainant either to give his evidence by way of affidavit or by way of oral evidence. If this - is made on affidavit, the same has to be accepted and such affidavit is required to be kept on record by the Court. The second part of Sub-section (1) provides that the complainant may give his evidence on affidavit and may, subject to all just exceptions, be read in evidence in any enquiry, trial or other proceeding. Thus, it is clear that once the evidence of the complainant is given on affidavit, it may be read in evidence in any enquiry, trial or other proceeding, and it may be subject to all just exceptions. 39. We are clearly of the opinion that according to the language of Section 145 of the Act, the evidence (examination-in-chief) of the complainant can be given on affidavit, and thereafter, if the accused so desires, he/she may request the Court to call the complainant for cross-examination. 7. The learned Counsel for the applicant has submitted that Section 145(2) of Negotiable Instruments Act consists of two parts. As per Section 145(2) the Court shall on the application of the prosecution or the accused summon and examine the person giving evidence on affidavit as to the facts stated therein. It is submitted that this provision leaves no discretion to the trial Court and in the event that an application is made, the Court has to summon and examine any person giving evidence on affidavit as to the facts contained therein. Mr. Thakore the learned Counsel for the applicant has further submitted that this Sub-section (2) of Section 145 was not taken into consideration by the Division Bench and the Division Bench only considered the provisions of Section 145(1). I do not find this submission to be correct. As observed earlier, this provision has been taken into consideration by the Division Bench of this Court in the case of KSL and Industries (supra). Thus, I find no merit in this submission. In fact paras 38 and 39 of the said decision, referred to above, make it amply clear that the Division Bench took into consideration the provisions of Sub-section (2) of Section 145 of Negotiable Instruments Act and has thereafter held that the evidence (examination in chief) of the complainant can be given on affidavit and thereafter if the accused so desires, he/she may request the Court to call the complainant for cross-examination. 13. Under section 144 of N.I. Act service of accused can be effected through registered post/speed post or by courier service and if the accused refuses to receive the summons, he can be declared served and court can take coercive measures for entering appearance of the accused. Chapter VI of Cr. P.C., under section 62, 63 and 64, provides how summons are to be served on accused persons by police. Section 65 thereof provides that if service cannot be effected in the manner as provided in section 62, 63 or 64 of Cr. P.C., the serving officer shall affix one copy summon on some conspicuous part of his house or area in which the accused resides and the court after making such inquiries may declare that the summons have been duly served. Thus service by affixation is a valid mode of service under criminal law and wherever the accused is evading his service, the court of MM should direct service through affixation as provided under section 65 of Cr. P.C. and in case the accused does not appear the court is at liberty to take steps for coercive appearance. 14. An issue arises where there are many accused persons in a case and some of them are not appearing, should the court proceed against those who are appearing or should wait for the completion of service of all the accused ? I consider that summary trial leaves no option to the court. The whole purpose of summary trial shall stand defeated if the court of MM tells the accused persons, who have been served, to come to the court repeatedly till the other accused are served. The plea of the accused is to be recorded on the day of his appearance under the summary trial and if that accused gets his plea recorded, he is at liberty to lead evidence in support of his plea and the court cannot tell him to keep coming repeatedly either in person or through counsel due to non appearance of other accused persons. The court, in such a case, asks him to disclose his defence and to prove his defence. In case court feels that the case should not be tried summarily and all the accused persons must necessary be tried together, then alone the court should ask the accused to wait but if the accused/respondent has a valid defence to show that he need not face trial because of a specific defence and he was prepared to lead evidence to this effect, he should be directed to lead evidence in support of his plea. 15. In most of the cases, the court of MM may not feel necessary that a sentence of imprisonment of more than one year should be inflicted. Unless the court, for reasons to be given, considers that the punishment in a case should be more than one year, the court cannot deviate from the procedure of summary trial and cannot ask the accused to appear again and again and defeat the very purpose of summary trial. Section 143 and 145 of N.I. Act were enacted by the parliament with the aim of expediting trial in such cases. The provisions of summary trial enable the respondent to lead defence evidence by way of affidavit and documents. Thus an accused who considers that he has a tenable defence and the case against him was not maintainable, he can enter his plea on the very first day of his appearance and file an affidavit in his defence evidence and if he is so advised, he can also file an application for recalling any of the witnesses for cross examination on the defence taken by him. 16. I consider that along with the notice of appearance, in view of the judgment of Supreme Court in 2010(2) R.C.R. (Criminal) 851 : 2010(3) R.A.J. 180 : Crl. Appeal No. 963/2010 & Criminal Appeal Nos. 964-966 of 2010, Damodar S. Prabhu v. Sayed Babalal H., decided on 3rd May, 2010, the court of MM should also inform the accused that in case he wants to make the payment of the cheque amount, he should either in person or through his counsel or representative sent the cheque amount, either in cash or through draft so that the same can be paid to the complainant and the case would thus come to an end. The accused also has liberty to make application on the very first day that he wants to compromise and in terms of the judgment given by SC in Damodar S. Prabhu (Supra) the court should dispose of the case by asking the accused to pay the cheque amount to complainant. The court should also bring to the notice of accused that incase he does not compromise at that stage, and if he enters compromise at subsequent stages then he will have to pay costs in terms of judgment of Supreme Court. Step II : If the accused appears, the MM shall ask him to furnish bail bond to ensure his appearance during trial and ask him to take notice under section 251 Cr. P.C. and enter his plea of defence and fix the case for defence evidence, unless an application is made by an accused under section 145(2) of N.I. Act for recalling a witness for cross examination on plea of defence. Step III : If there is an application under section 145(2) of N.I. Act for recalling a witness of complainant, the court shall decide the same, otherwise, it shall proceed to take defence evidence on record and allow cross examination of defence witnesses by complainant. 18. In all above Criminal Miscellaneous Petitions the petitioners have come to this Court raising one or the other defence. I consider that since summoning order in all these cases have been issued, it is now the obligation of these petitioners to take notice under section 251 of Cr. P.C., if not already taken, and enter their plea of defence before the concerned MM court and make an application, if they want to recall any witness. If they intend to prove their defence without recalling any complainant witness or any other witness, they should do so before the Court of MM. These petitions are, therefore, hereby dismissed. 19. The petitioners shall appear before the Court of concerned MM and trial shall proceed as stated above. A copy of this judgment be sent to all District Judges for circulation among Officers of DJS and DHJS.